Me: You'll also notice L, that I am not wearing a school uniform, that I have boots on, and that I don't have a planner out on my desk. L: Yeah well you're no different to us! L: You're not different! You're just....adults. Me: Yes, we are different because we are adults. Me: How old are you, L? 12? Me: Nearly three times as old. A pause. Maybe five whole minutes during which L kept looking over his shoulder, trying to find someone to distract him. I look up to see a huge chunk of cereal bar in his hand, under the desk. Love how students think under the desk is invisible. There's no front to anybody's desk, except mine - another way in which I am different. Me: Put it away, L.
L: (sliding hand into bag) I haven't even got anything! L: What, it's not even food! Me: But, it....it was food! Me: If it's not food, why are you eating it? I do very much enjoy teaching him. The Olympics have begun! So excited. I watched part of the opening ceremony on Friday but a work friend inconveniently had a birthday party at a Mexican restaurant so I had to go out and drink lots of tequila, oh, the humanity. I got this on the needles on Saturday afternoon and worked on it all yesterday while watching the board slopestyle and bits and pieces from the women's moguls. It is the Swivel pullover from the last issue of Interweave, knitted in blue faced Leicester by Laal Bear that I bought at last April's Wonderwool. Lovely yarn, and a great colour - it's one from the naturals range. I like how the cable is coming out in it - nice and crisp. My only concern is that it's not going very quickly. Some sweaters just seem to fly off the needles, don't they? This doesn't feel like one of them. I am pretty tired though and spent lots of time yesterday dozing, and this evening. The end of term is catching up with me. Hopefully I will be able to pick up the pace a bit. Here's one of my favourite Sochi moments so far - an Indian luger who fell off, knocked himself out, rolled back onto his luge and finished unconscious. Brilliant. I also very much enjoyed Jenny Jones winning bronze yesterday and the men's moguls was good today. Can't wait for the ski slopestyle and the board across. TBH I'm enjoying all of it. Poor Mr Z.
I managed two over the weekend; according to my project notes from when I knitted these pinwheels for a shawl (that has become probably my most-worn scarf) I can get about 4.5 from a skein. I now have 16 skeins of this yarn in various shades of blue; I may have also just requested two more skeins in a discontinued blue colourway from someone's stash sale on Ravelry. A conservative estimate therefore puts the blanket at 72 pinwheels, which is probably plenty big enough. I don't want a blanket that is big enough to cover our entire property, a la Like Water For Chocolate. I am not sure whether all of the colours will go together: some have quite a lot of green or purple in which might clash, so I may see if I can find another use for those odd skeins. 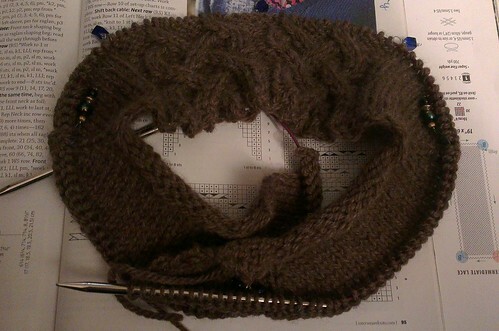 I'm prepping for Sochi which starts at the end of the week; I want to knit a jumper during the two weeks period. I have a pattern picked out and I need to swatch for it; so I think that will probably be consuming my every available knitting moment for the next couple of weeks. When I visited Jimmy Beans in the summer I saw a bin of these in the middle of the shop, after I had already bought all the yarn I wanted. It was a big splurge for me and I was just a little bit too embarrassed to hoik out a skein and go to the till with it. Fast forward to yesterday, when I wandered into Shaw's up the 'wood for the first time in ages to peruse their yarn stock. My tutor group are coming up to their final year now which means it's time to start knitting hats again, so I thought I would see what was available. Low and behold - a whole cubby hole full of Lumio, in a variety of colours, and only £4.95 for the ball! I snagged this one immediately. I may go back for more. Need doesn't come into it when you can support your LYS, I think. In case you can't see in the big picture, it has tiny strips of reflective material wrapped around it. Perhaps if I had a hat made out of this I would go running in the evenings.